SPRING SAVINGS: SAVE $2,000 - Sale Price: $11,199 - Reg. Price: $13,199! 2018 Can-Am® Outlander™ XT™ 650 Intense Red WELL-PREPARED WITH FACTORY-INSTALLED FEATURES Expand your off-road capabilities with added features – and added value. Get equipped with Tri-Mode Dynamic Power Steering (DPS), a 3,000-lb (1361 kg) winch, and heavy-duty front and rear bumpers. 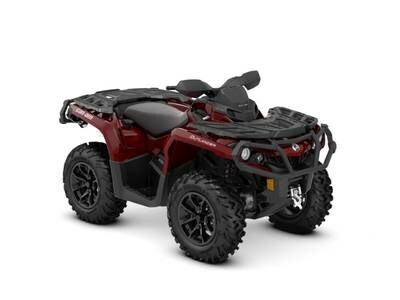 Features may include: ROTAX 570 V-TWIN ENGINE CATEGORY-LEADING PERFORMANCE Equipped with the 48-hp Rotax 570 liquid-cooled V-Twin engine, with four valves per cylinder and single overhead camshaft, this Can-Am engine delivers best-in-class power while being reliable and efficient. TRI-MODE DYNAMIC POWER STEERING (DPS) PRECISION-ENGINEERED HANDLING The Tri-Mode Dynamic Power Steering (DPS) offers easy steering assistance to the rider, adapting the level to the vehicle's speed. At lower speed, assistance is increased to reduce steering effort while at higher speed assistance is reduced to keep maximum steering feel to the rider. On top of that, it is possible choose between three levels assistance that can be adapted to match each rider's preferences. WARN WINCH POWERFUL WINCH This powerful winch with a 3,000-lb (1,361 kg) capacity is factory-installed and can handle the toughest situations. 12-IN. (30.5 CM) CAST-ALUMINUM WHEELS WITH 25-IN. (63.5 CM) TIRES DURABLE WHEELS Centerless 12-in (30.5 cm) black painted cast-aluminum wheels reduce weight and offer improved strength in strategic areas. The wheels are wrapped in 25-in. (63.5 cm) Maxxis tires for rugged performance on tough terrain and changing conditions. HEAVY-DUTY FRONT AND REAR BUMPERS ADDED PROTECTION The front and rear bumpers are factory installed and are covered by a factory warranty. The added protection gives peace of mind in rugged conditions.